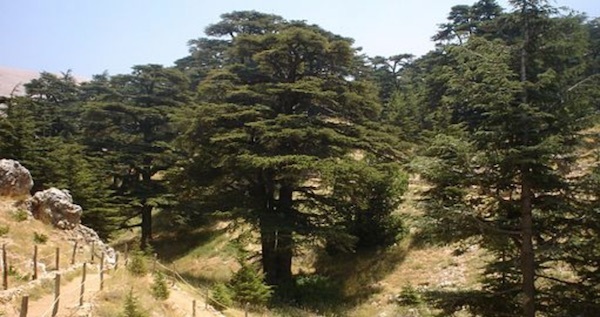 In the human imagination, and as they have been throughout the ancient world, the cedars of Lebanon are sacred trees, planted by God. They are long-growing, strong, the material of temples and voyages in sea-roaming ships. Five thousand miles from Lebanon, we live: a small human community of five families. We are humble caretakers in the midst of 1400 acres of protected land. An unusually wet spring and mid-summer punctuated by record heat and resplendent sunshine has made an abundant jungle in the forest and around our homes. Berries, cucumbers, and squash ripen in the garden faster than we can harvest, weeds grow amok, spirea and wine berries lace themselves across the forest paths, a raccoon removes the window screen and consumes all the cornbread, a bear demolishes the dumpster lid and flings garbage everywhere, grasses spring tall minutes after the mower passes, a forgotten open gate welcomes deer to the beans, an indigo bunting flashes past the car window. Foxes, rabbits, copperheads traverse our landscape and dance in our dreams. 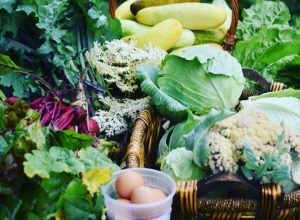 Anything could happen in this profligate season on our imperiled and precious planet. Some bright days I take a walk in the forest, where the sheltering canopy is a glowing emerald ceiling. Patches of bright green moss lie across earth and rock like plush accent rugs. Pileated woodpeckers rocket from tree to tree. Their red crests are shots of crimson in the green light. The intricate yellow pattern of a box turtle’s shell is discernible in the lush weeds by the creek, which sparkles and tumbles gustily over stones and rocks. Gratitude and grief are the tightly entwined melodies of the moment. As I push on through my seventh decade, I wonder what is needed now, what is being called forth from me uniquely in this time and from the wider communion of all beings, for I am certain that I am not in this alone. I wonder about the meaning of terms such as “elder” and “crone” and whether there is an invitation presented by having lived for a while in this world full of shadows and light. The Lebanon cedars are a luminous, recurring image in ancient texts, redolent of beauty and resilience. Their fragrance is holy, and their oil is used for cleansing and healing. In the Song of Solomon cedars are the face of the Beloved. For millennia these trees have given rise to awe, veneration, and courage in the human heart.